ON THIS DATE (September 6, 1986) ... The Red Sox' 3-2 victory would not have been possible if Oil Can Boyd (14-9) hadn't become razor tough after falling behind by two runs in the third inning. The skinny right-hander mowed down the last 12 batters he faced in setting the stage for Boston's sixth-straight come-from- behind victory. In the ninth inning alone, he struck out three men (Kent Hrbek, Gary Gaetti and Tom Brunansky) who have a combined total of 78 home runs. 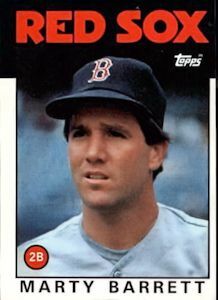 Without Boyd's effort, second baseman Marty Barrett might never have gotten the chance to deliver pinch runner Dave Henderson with a game-winning single in the bottom of the ninth. Minnesota starter Mark Portugal had pitched 6 1/3 strong innings before leaving with a 2-0 lead. But The Can shut the door on the last-place Twins, and he and the 31,236 at Fenway waited for the Sox' usual late-inning uprising. Boyd, who has not talked to the Boston media since returning from his suspension, has let his pitching do his talking, although today he gave new meaning to the term "body language." He pumped, fumed and pranced around the mound more than ever this season, becoming equally aroused by both his mistakes and his successes. When he retired the side in the third inning after giving up two runs, for instance, Boyd spiked the ball in anger with Hrbek not 5 feet away. Then, after striking out the side in the ninth, Boyd strutted off the mound like a prize peacock. The Sox have a tough lineup and in the eighth, down 2-0, a double by Wade Boggs and Jim Rice's two-out single produced a 2-2 tie. Then, in the ninth, the Red Sox took the game away from the Twins. It started with rookie Pat Dodson, who hit a two-strike pitch between first and second. Steve Lombardozzi made a diving stop but had no play. Boggs then walked, bringing up Barrett. Keith Atherton replaced Frazier and worked the count to 2 and 2 on Barrett, who then drilled a solid single to right. Dave Henderson, who was running for Dodson, got a good jump on the play and slid home before Reed could apply a tag. Boyd's most animated moment came when he charged out of the dugout after Barrett's game-winning hit, gave the second baseman a bear hug and proceeded to give high fives to everyone in sight except groundskeeper Joe Mooney. The Red Sox had won seven in a row, their longest streak of the season. They were 27 games above the .500 level for the first time and had 34 come-from-behind victories with 13 occurring from the seventh inning on. The Sox had won 15 games on their final at-bat.